CITY TOUR: book your City Tour and visit the city in one day! Which bus should I book? Is it possible to purchase ticket on spot? Where? How many time prior should I purchase my online ticket? How much do the tickets cost? 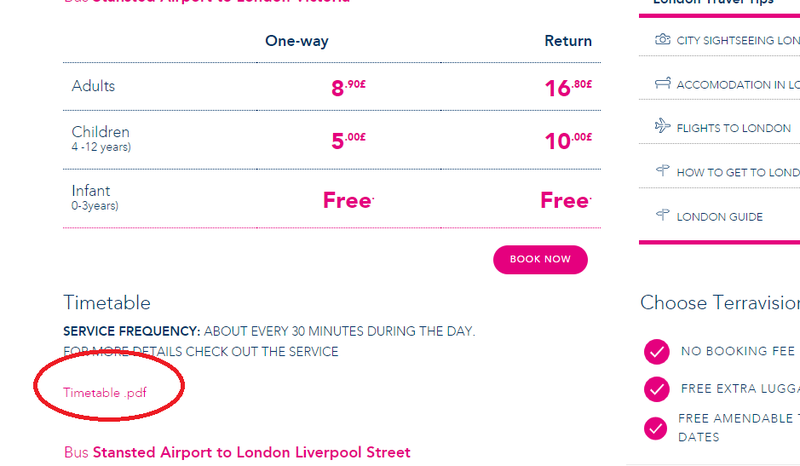 Do children travel for free? Where is the bus stop located? Where can I find the timetable? How can I make payment on Terravision website? Issues with the reservation, what can I do? How can I know if the reservation has gone through? How can I download my ticket? Is it compulsory to print tickets? How many time prior should I be at the bus stop? Is the ticket valid for the booked ride only? Should I pay an extra for the baggage? Are pets allowed on Terravision buses? Have Terravision buses lifting platforms for disabled persons? Is it possible to bring special baggage on Terravision buses (e.g. bikes, surfboards)? Will the bus wait for passengers in delay? Is it possible to modify/delate my Terravision ticket? How can I do it? I have booked the wrong route. Can I use my ticket in any case? The name of the passenger is different from the name on the ticket. Is it a problem? I want to share my opinion about my experience on Terravision buses, who should I contact? Is it possible to receive an invoice for my reservation? I have lost my baggage/my personal items on board of Terravision buses, how can I recover it? Non riesci a trovare una risposta alla tua domanda? If your question has not been answered, please send us a message at customerservices@terravision.eu or a private message on our Facebook page. We are glad to help you! You can book the ride you wish! In most cases, Terravision tickets are valid for earlier and following departures time on the booked date, always depending on the seats availability. Please bear in mind that if you are travelling to the airport, Terravision always recommend to book a ride which allows you to be at the airport at least 2 hours before your flight departure time. ATTENTION! The information above is not valid or may change for the following services: Amsterdam, Oporto, Reykjavik and door-to-door services. ATTENTION! For all buses departing from Cologno Monzese, it is necessary to reach the bus stop with a printed online ticket. It is not possible to purchase tickets at the bus stop! Online tickets: you can purchase tickets on Terravision website until few hours before the departure time, this may vary according to the service you need. Before purchasing a ticket, please be sure that the date of travel is correct! If the rides of the day are no longer available, the system may automatically shows you the first rides of the following day. Tickets on spot: you can purchase tickets on spot at any time of the day. In this case, you will have open tickets valid 3 months from the purchase date, but please note that passengers with online tickets will have the priority boarding! This is the reason why Terravision recommends to purchase online tickets. The cost of the ticket and the cost per age range may vary depending on the service you are interested in. It is possible to check all prices by visiting the dedicated section “Price and Timetable”. You can easily find your bus stop by checking its map on Terravision website. In order to check all available departures of the service you need, we suggest you to use the booking engine on Terravision website. You only need to enter the departure date and time, the system will show you all available rides. If you wish to have a PDF copy of the timetable on your smartphone, you only have to visit Terravision website, select the service you need (e.g. 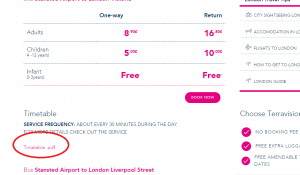 : Bus Stansted airport – London) and then click on “Price and Timetable”. Scrolling down you will find “Timetable.pdf”. You can purchase your ticket on the Terravision website in just a few easy steps thanks to the Terravision booking system. It is possible to make payment with a Visa or Mastercard credit card or with a prepaid card. If you are not able to complete your booking for some reason, we suggest you to use a different browser, cancel the cache and try to make a new reservation. Once the reservation has been made, you will receive a confirmation email with all reservation details. If you did not receive the confirmation email, first of all we suggest you to check in the junk mail box (spam) and then to check your bank account statement to verify if you have been charged for the order amount. If you have not received the confirmation e-mail and the amount has not been deducted, the reservation is not successful. This information may vary depending on the service you need! Please note that it is necessary to reach the bus stop at least 15 minutes before the scheduled departure time of the bus. IMPORTANT! For the service in Reykjavik, the pick-up takes place 30 minutes before the booked time. Terravision does not apply any additional fees for baggage nor there is a limit on the number of bags that can be carried as long as there is space available in the luggage hold. Small hand luggage is permitted on board as long as it fits in the overhead compartments and is not a security hazard, which is at the complete discretion of the driver. Unfortunately, pets are not allowed on board of Terravision buses. Only for the services Bergamo-Milan and Malpensa-Milan it is possible to bring animals on a leash or in the appropriate transport box. Special baggage such as stroller, wheelchairs or bicycles can only be carried on Terravision buses, if foldable. In regard to objects with a greater size, such as surfboards, the transport may depend on the available space in the luggage hold. Since the service is shared with other passengers and connects the airport to the city, the buses, except (in cases of force majeure) must follow the timetable established by the company, therefore it is not possible to wait for passengers in delay. However, we remind you that on the large part of the services you can use the same ticket for the previous and following rides (more information in point 3). Is it possible to modify/cancel my Terravision ticket? How can I do it? Unfortunately Terravision has a no cancellation policy, therefore it is not possible to cancel a reservation. The ticket will open and you will have 2 options. I have booked the wrong route. Can I use my ticket any case? Terravision system automatically issues tickets with the name of the registered user that booked the ticket. However, our tickets are not nominative, so other passengers may use the purchased ticket. IMPORTANT! This information is not valid for door-to-door services. In this case, contact our Customer Service well in advance by sending an email to customerservices@terravision.eu and providing the name of the passenger. If you wish to share your experience with us or you need to talk to a member of the staff, we suggest you to contact our Customer Service by sending an email to customerservices@terravision.eu or by sending a private message on the chat on our Facebook page (Terravision Transfers). Our Customer Service answer to your requests from Monday to Friday from 9:30 to 17:30. IMPORTANT! If you purchased your ticket from the staff on spot, please send us also a copy of the ticket in question. In case of loss of luggage or personal items, the first thing to do is to ask for assistance to the staff on spot. If the staff do not find the item/baggage in question, please send an email to customerservices@terravision.eu providing a description of the object itself and the date, time and route in which the incident occurred. Our Customer Service Dept. will keep you updated. For compensation, we suggest you to contact your insurance company directly.